How many empty notebooks do you have? Half-empty notebooks? Notebooks with the first page filled out and then nothing but sad, blank pages after that? Don’t worry ;) There are lots of people on this boat. I’ve always been drawn to the stationery aisle, oohing and aahing over the pretty covers and flipping through the fresh pages, full of creative possibilities. The problem is, once you come home, you don't want to spoil the pages until you've got the best idea for how to use them. The next best alternative is leaving the blank notebook in a lonely drawer somewhere. So in the spirit of minimalism, mindful buying, and using everything to its full potential, I decided to put together this extensive list of ideas for ways to use those empty pages. There are plenty of good reasons out there to put pen to crisp, clean paper. So grab those unloved notebooks, a pen, and let’s start filling them up! I hope I’m not turning you off the idea of journaling by calling it a “plain old diary”. It’s just the most obvious and simple use for a notebook. 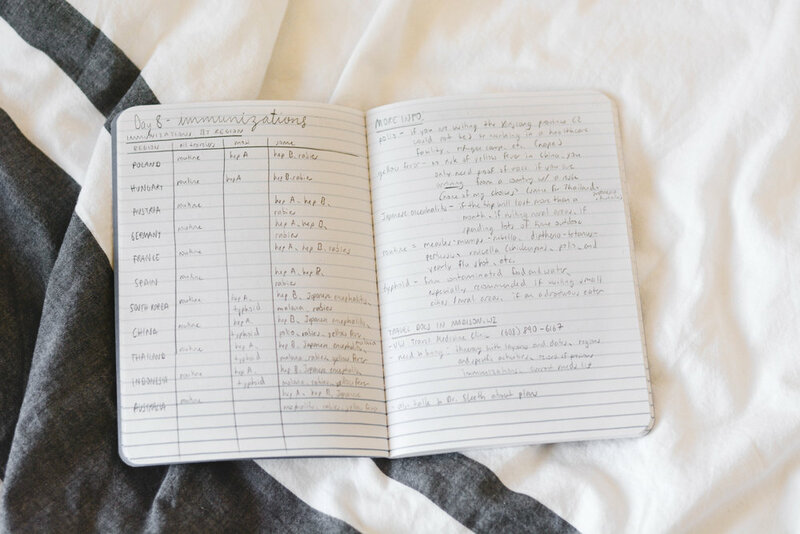 In fact, journaling is one of my most important habits and I’ve blogged a lot about how you can use it to live your best life. So don't just skip over this first idea! Seriously, tryyy it. Even if you’re not a student doesn’t mean you have an excuse to not be learning things! There are plenty of sites out there that offer resources to learn and improve skills. You can also watch YouTube videos (this is how I learned most of what I know about Photoshop and Premiere), and read books (yes, those big, paper things you get at libraries or bookstores). Taking notes while you read or watch will help you remember everything you’re taking in and make the time you’re investing in education worthwhile. Dreams are fascinating, but they are also incredibly fleeting. I’m not very good at remembering my dreams and when I wake up I can hardly crawl over to my phone fast enough to type them out! Consistent dream journaling, however, will make this process easier because it’ll train your mind to start remembering your dreams. And then? You can analyze the patterns you see in your dreams and deduce what they mean, or even try to learn lucid dreaming (a dream state in which you are aware that you are dreaming and can control the dream). Or you can just laugh with your friends about how stupid your dreams are, that works too (I recently had the most mundane dream where I was having dinner with extended family and giving them tips for managing e-mail... oh, the mind of a blogger). I’m sure you’ve heard that writing down your goals helps you achieve them. Well, isn't a new routine basically a goal to do something consistently? 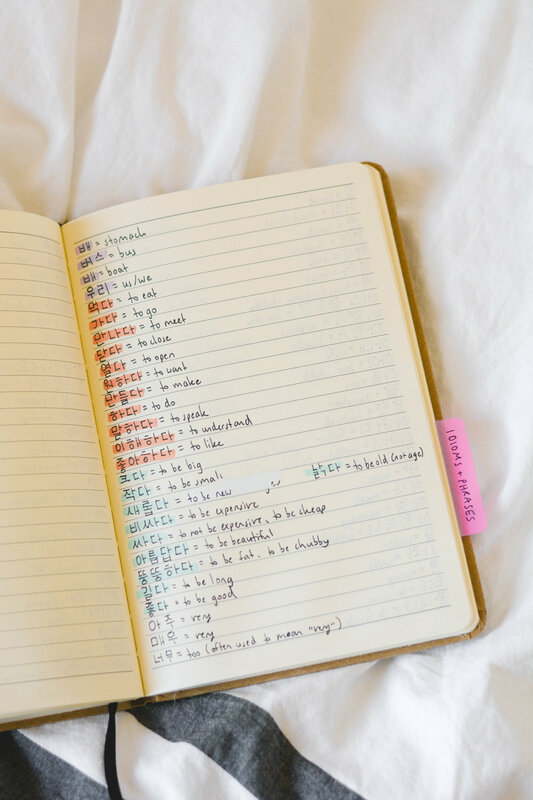 So use your notebook to keep track of different routines that you have, whether it’s a morning routine, bedtime routine, daily/weekly/monthly planning routine, Sunday routine, etc. The list goes on! You can tweak your routines as you try new things and get rid of old steps. I recommend using paper because it’s more tangible and the process of writing the routine out by hand gets cemented in your brain more. Plus, it’s easier to follow something written out on paper. You don't want to be looking at screens before bed, so referring to your phone for your bedtime routine is not the best idea! You can use an empty notebook as a planner by creating your own layout. Whether that’s rows, columns, or just little to-do lists, the freedom to make it completely yours is something you can’t get with store bought planners. For inspiration, check out how I used to set up my old planner (I have switched to digital planning) to track my daily and weekly habits. Shoutout to my fellow bloggers out there. You all are freaking AMAZING. Blogging is hard work and a notebook can help to organize all of the odds and ends involved in this crazy hobby/job thing. You can use it to: take note of post ideas, flesh out blog posts, plan out your content calendar, sketch out graphic designs, keep track of social media passwords, etc. This notebook will do exactly what the name says. It will catch all of the random little ideas, questions, and to-dos that pop into your head during the day. It’s super easy to keep a little notebook and pen in your purse or backpack and it’ll ensure that all of your genius ideas don’t slip through the cracks. Take a few seconds at the end of the day or week to check out what you wrote in there and transfer the information to the place where it belongs. For example, if you came up with a blog post idea on the train?, you can add it to the “blog post ideas” Google Doc that you have. Learning a language on your own is totally doable, especially with all of the resources that are available out there. Set yourself up for success by getting organized from the get-go. Divide your notebook into whatever sections you think you’ll need. For example: grammar, practice exercises, vocab, phrases/idioms, etc. I’m currently learning Korean and it has been so motivating to have all of my material in one place and to be able to go back and study by simply flipping a few pages back. If you’re looking for more tips for learning (anything), check out my study tips post and video! My travel board on Pinterest has its fair share of aesthetic pictures of illustrated and decorated travel journals. Even if you choose not to go the artsy route, dedicating a small notebook to a trip can create a priceless souvenir and will help you experience the trip in a whole new way. At the very least, record the places that you visit and write about your days. If you want to get more creative, add illustrations, print out some photos, and paste in mementos like sugar packets, tour/museum tickets, transportation tickets, small brochures, stamps, maps, etc. Whether you’re learning calligraphy, brush lettering, or just plain cursive, practicing in the same notebook will not only inspire you to practice but it’ll make it easy to see your progress. Make sure you write down dates so that you can compare your work! Lists are a great way to spark your creativity because they force you to think outside of the box. Here are a bunch of ideas on Today for lists you can write. Think of it as a vision board except in notebook form. Cut out pictures from magazines, doodle, draw, and write down words that inspire you. Add your personal touch to it, because remember, no one has to see it but you. You might find this type of notebook to be a great source of inspiration when your ideas are running dry. Artsy? Use a notebook as a sketchbook to give you a dedicated place to express your creativity. Again, date your work so that you can see your progress! Planning a trip requires a crap ton of details: hotel reservations, flights, buses, passport information, contact information, addresses, etc. If you’re planning a huge trip, like a round-the-world trip, you can use a notebook to keep track of all of these details. Personally, I’ve gotten better at using my notebooks since I started journaling regularly. Let me tell you, journaling every morning and evening takes up a LOT of space and my new problem is running out of notebooks and trying to find places to store the full ones. So let me know in the comments which of these ideas you’ll be using to fill up your notebooks and as always, happy Monday!